Healing has its origin from the word haelan, the state of being hal, which is the Scottish and North English form of whole. This word hal has since been given the literal sense of “being free from infirmity”, and acquired a meaning of “being healthy and uninjured”. Hal is also the root of “holy” which is defined as spiritually pure. Derivation from the same medieval root brings to mind a long-standing association between the concept of healing and the perception of wholeness and spirituality. However this concept challenges biomedical thinking because modern Medicine has no model of what it means to be “whole” as a person. How then, should we understand the meaning of “being whole” in the context of illness? 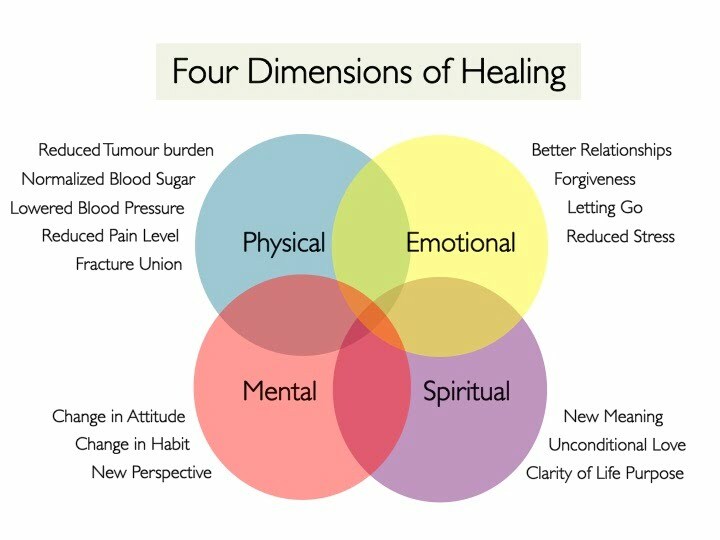 Healing is different from eliminating or suppressing symptoms. The process has become somewhat foreign to the culture of modern Medicine. It is essentially a reversal of the process of illness and at the same time, evokes an awakening to one’s true nature and meaning of life. The process takes place at all the four levels of the selfhood - physical, mental, emotional and spiritual. At the physical level, healing involves medical attention to anatomical wounds and allows the tissues to unite, regenerate and consolidate. The biological process is often helped significantly by a reminder to restore oneself to a healthy lifestyle, balanced diet, supplementary nutrients and changing one’s level and type of physical activity. At a mental level, healing involves the taking of individual responsibility to commit to health and happiness. Healing occurs from within, not from without. Many damaging attitudes get in the way. Holding the therapist or physician responsible for the outcome of one’s recovery is one example. While the therapists or physician facilitates the healing process, they do not cause it to happen. The individual’s mental process does. A victim mentality is another example. When one believes that he is a victim of his upbringing, partner, colleague or disease he disempowers himself and gets stuck with his healing process. For many people, their beliefs create their reality. These thoughts are often so entrenched in the subconscious mind that they override any conscious attempts at change. At the emotional level, healing involves forgiveness of self and others and the release of any emotional tension, attitude or thought that is blocking one’s recovery path. It also involves letting go of all behaviour that is not conducive to a positive mental attitude or emotional wellbeing. A lot of our behaviours are driven by emotions such as fear, craving, anger, desires and guilt and healing requires one to detach from these. Several methods are available to help us and this includes traditional psychotherapy in Medicine. Regression therapy, which is one form of psychotherapy, takes one back in time to events which are the root of one’s emotional issues, is a particularly useful technique. The healing with this technique involves the process of reliving, revisiting, reframing or reprocessing old emotional hurt and trauma so that they are healed at the deepest levels. At the spiritual level, healing involves the expansion of one’s awareness of who one is, why he is what he is and his purpose of life. Spirituality does not mean religion and we are not talking about religious healing here. Rather, the healing at this level refers to getting in touch with one’s inner self, which is vast and powerful. Through one’s inner wisdom, he is able to pursue and discover the meaning of his life and illness. The process involves the understanding of unconditional love. Love is the essence of what we are and the force that keeps us going. When we love ourselves enough, negative energy patterns disappear and the body heals. A breakthrough would then come with a shift in consciousness. Hence, by helping patients transcend suffering, physicians will be able to surpass their curative roles to claim their heritage as healers. This in turn will facilitate Medicine to maintain its tradition as a healing profession.